Due to unforeseen circumstances we unfortunately have to postpone our Dionysus event. We hope to set a new date and possibly new venue very soon and will obviously announce it as soon as details are available. It will probably be in October and most probably still in North or North West London. In the meantime we have merchandise and awareness stalls and other events in the London area, so please keep an eye on our Facebook page if you are on Facebook or check our events page here regularly. We look forward to meeting many of you this year, old and new supporters. 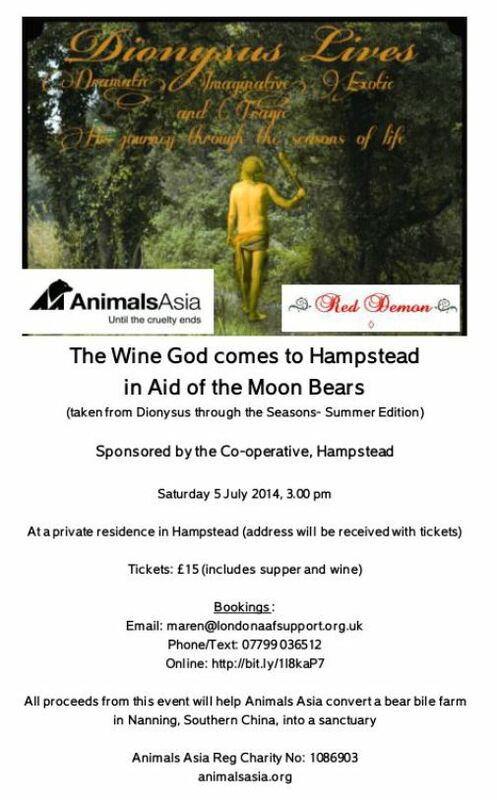 The event is sponsored by the Co-operative, Hampstead and all proceeds will go towards Animals Asia’s conversion of a bear bile farm in Nanning, Southern China, into a sanctuary. For those of you who haven’t read about this amazing and unique project yet, please visit Animals Asia’s website to read how the lives of the 130 bears at the bear bile farm are going to be transformed. Dionysus was a Greek God like no other. He loved all of nature and to him it was the essence of life and death. He hated conformity. He worshipped wildness and liberty. Dionysus had a vision of a true wilderness with ivy, wild flowers and vines covering the whole of Greece and where no animal would be in chains. The woman folk would join him on the mountain top, all drinking copious amounts of wine through the day and night, and dancing barefoot through the wild, mysterious forest. You can book online here or if you’d rather pay by cheque or cash please complete the form below and we’ll get back to you with details.